Clark the Carver of Carve Me A Bear! 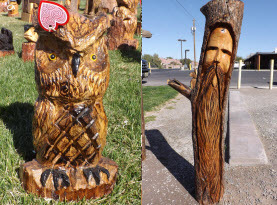 Chainsaw Carvings has over 30 years of experience practicing the great art of chainsaw carvings to offer the Las Vegas, NV and surrounding area residents magnificent art sculptures. His talented works have not gone unnoticed, as Clark the Carver has earned numerous awards and accolades. 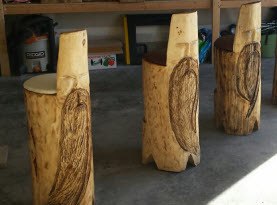 His extraordinary talents include carving an array of custom designed animals, totems, tikis, welcome signs, furnishings, and so much more. Carve Me A Bear! Chainsaw Carvings is the perfect gift idea for anyone that enjoys collecting art, landscape ornaments, and avid collectors of specific themes or favorite animals to add to any home, business, or landscape. Among the many animals Clark the Carver can fashion from a hunk of wood and his trusty chainsaws is the enchanting wolf. Wolves have been revered by many cultures and intrigue many people with their pack unity, nobility, beauty, strength, and many other attributes they possess. Some people have found a profound desire to collect wolf paintings, knick-knacks, and other little trinkets due to their fondness of wolves. No matter if you want to treat yourself or have a wolf lover loved-one, you will be captivated by the detail, charm, and extraordinary chainsaw carving of a wolf executed by Clark the Carver of Carve Me A Bear! Chainsaw Caravings. The wolf has had a starring role in both European and North America in many myths, legends, stories, penned in poetry, and on the big screen from current days, back to times of old. Wolves have majesty and though nearly hunted to near extinction; most folks hold wolves in high esteem and glorify their presence with tributes and respect. Wolves are often depicted a fearsome and ferocious predators, fierce warriors, and even used as cautionary fixtures. Wolves are even associated intermingling with man as Lycanthropy, or werewolves. Some Native American tribes believe their tribe originated from wolf becoming man and other similar notions. Wolves live in packs, consisting of anywhere between two members and over 30 individuals. Wolf packs are tight nit entities that protect one another as well as hunt together to bring down their prey. Experts believe the howling stems from a communication between the pack. Wolves generally pick a mate for life. Domestic dogs all have wolf or wild dog lineage, including coyotes and dingo. Wolves are very intelligent and have a strong social structure, and their allure is what keeps many people spell bounded by their piercing eyes, exquisite fur and coloring, and their memorizing piercing howl. With Carve Me A Bear! Chainsaw Carvings! and Clark the Carver producing fine wolf sculptures, your wolf chainsaw carving is within your grasp, to a have a one of kind of wolf addition to your home, business or landscape. Carve Me A Bear! 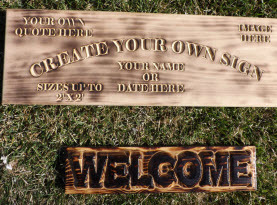 Chainsaw Carvings has a variety of wolf chainsaw carvings, and the genius to carve your custom wolf design. For those with a dead stump in their yard, instead of hiring and expensive tree removal specialist, commission Clark the Carver to transform that tired old stump into a delightful wolf chainsaw carving to enhance your landscape. 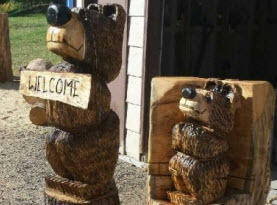 Call us today to get your hands on one of Clark the Carver of Carve Me A Bear wolf chainsaw carvings for your Greater Las Vegas, NV home or business!